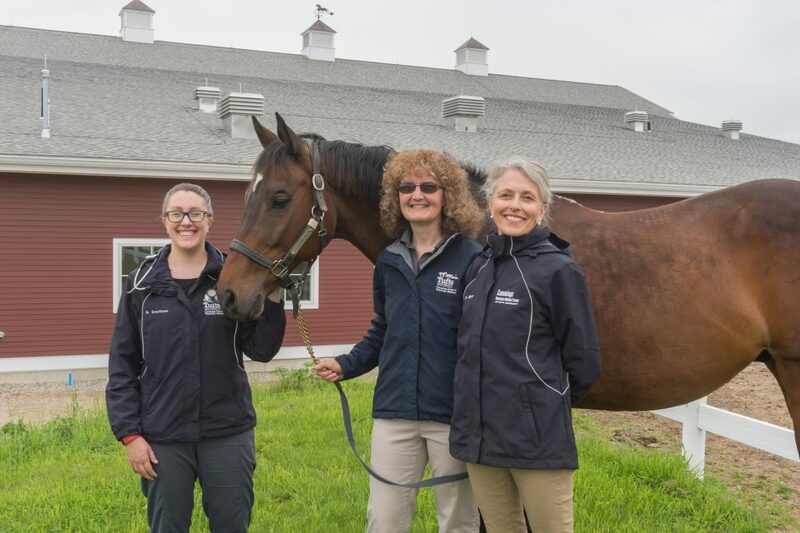 Tufts Equine Center is home to the largest veterinary critical care and diagnostic center for horses in New England. Our board-certified veterinary specialists provide 24-hour intensive care and medical services in our state-of-the-art facility. We are one of the few providers in the nation with an expert internist who is board-certified in Internal Medicine, as well as Emergency and Critical Care. Our faculty, residents, technicians and staff work together as a collective health care team, drawing on their combined experiences that span across a wide range of specialized medical fields. We offer consultation, diagnosis and treatment services for a broad spectrum of medical conditions including infectious, immune-mediated, endocrine, nutritional and metabolic problems. Ongoing research in the areas of infectious disease, immune function, geriatric medicine, airway disease and pharmacology, as well as metabolic and endocrine dysfunction contributes to the advancement of veterinary care. Information gained through this research is translated into new diagnostics and treatments for many of the known equine diseases. Our Isolation Facility is unparalleled in New England. We are equipped to treat patients with illnesses due to infectious diseases such as strangles, equine herpes virus type 1 (EHV-1) and salmonellosis. The Internal Medicine team offers innovative and highly specialized care ranging from respiratory and muscular disorders to advanced diagnostics and procedures. The Internal Medicine team is led by Drs. Daniela Bedenice, Nicholas Frank, Alisha Gruntman, and Melissa Mazan offering innovative and specialized care for your horse. I especially want to mention Dr. Bedenice who made making a difficult decision easier. She and Dr. Sage kept me well informed throughout the day. Dr. McKinney spoke to me the evening before and to my referring vet well after hours which was also appreciated as was her help in translating during the day when I needed something repeated. A great team. Dr. Frank was exceptional- I have been to Tufts on several occasions and was beyond impressed with Dr. Frank’s professionalism, ability to explain information and overall care and concern.